This review originally ran after its world premiere at Fantastic Fest. It has been updated for its theatrical release. AUSTIN – The Bad Robot mystery box, when used with care, has been a genre device that has all but revolutionized studio storytelling. J.J. Abrams created a blindfolded movie-going experience with the ability to draw in some eyeballs (looking at you CLOVERFIELD), an experience that, for better or for worse, brings something newish to the table each time around. Bad Robot is essentially an Amblin for the modern age; it’s fun and audiences should celebrate the company. But with Abrams’ latest producing excursion, OVERLORD the shroud of mystery is completely thrown out with the bathwater. Penned by veteran screenwriter Billy Ray (THE HUNGER GAMES) and directed by Julius Avery (SON OF A GUN), OVERLORD slams all its cards on the table with its chest puffed out for a big-budget “B movie” that brings forth thunderous action and (tempered) homages to horror’s most celebrated films. Opening with a wallop of a sequence on the eve of D-Day, OVERLORD introduces an American para-trooping company preparing to disable a French communications tower. Director Julius Avery pulls out all the stops when it comes to showing war violence, even when the visual violence becomes slightly repetitive. The plot is just a warm-up for the much-desired Nazi killing. We enter this zombiefied man-on-a-mission story through the eyes of Pvt. Boyce (Jovan Adepo) as he counts down the 90 minutes to his first jump. Boyce is part of a group including hard-nosed Corporal Ford (Wyatt Russell), Tibbet (John Magaro, giving his best NEW-YAWWK accent), Chase, the photographer (Iain De Castecker) and Captain Eldson (the always welcome Bokeem Woodbine). This opener packs a massive punch that leaves you paralyzed in your seat. As the action unfolds the group of soldiers finds themselves locked inside the home of French woman Chloe (Mathilde Ollivie), who lives with her brother and sickly aunt (Meg Foster). We find out what the Nazis are really up to through Dr. Wafner (Pilou Asbaek), a disturbing brute who has been harassing Chloe. Asbaek has made quite a name for himself outside of his native country Denmark as a mustache-twirling villain who revels in the absurdity of his characters. It turns out the Nazis are conducting experiments in their labs to create a legion of super soldiers called the “1,000-Year Reich” in hopes of taking of the world. It’s gross, and there are super-human Nazi zombies. That’s all you need to know. When the film makes these pivots, the waters become a little murky, but Jovan Adepo handles the role with grace. He has a wide-eyed nobility to his performance that pulls us into the gravity of the situation and finds the courage to execute the tasks at hand. Adepo showcases the talent that brought him toe-to-toe with Denzel Washington 2 years ago for FENCES. Adepo works alongside Wyatt Russel’s calloused sensibilities which is a far cry from his typical wavy-gravy persona. Ray’s screenplay keeps the film oscillating between genres for a Frankenstein’s monster type of epic that mixes NIGHT OF THE LIVING DEAD and RE-ANIMATOR, with varying degrees of success, all cloaked under the guise of SAVING PRIVATE RYAN. 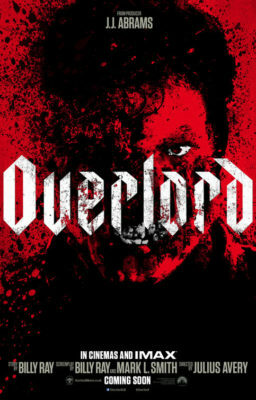 Part of me can’t help but wonder what Steven Spielberg, George A. Romero and (the great) Stuart Gordon would say about OVERLORD. OVERLORD often gets lost in its ideas. The film isn’t always rich, but some of the ideas are cobbled together with little explanation. Avery’s style as a filmmaker grits its teeth and gets the job done with a workman’s ease that never feels forced. He appears to be the type of filmmaker that can exist peripherally to the horror genre, but easily dip his toes into other projects outside of this cooky exhibition. OVERLORD doesn’t disappoint on its promise of being an implausible spectacle, but part of its faults is not going full out on its insanity. Maybe the studio is to blame for wanting to reign in its filmmakers quite a bit. However, there’s enough madness to keep any Nazi hater satiated. OVERLORD opens nationside November 9.